I designed today's baking experiment around making autumn macs that were NOT filled with buttercream. I've had a lot of success filling my recent macarons with buttercream, but I just wanted to try something different. My first batch today are cinnamon macarons filled with a unique filling called Pear Cream, which is basically a custard mixed with cooked/pureed pears. A splash of pear brandy is added to bring out the flavor and then the custard is blended with butter to give the filling some creaminess. 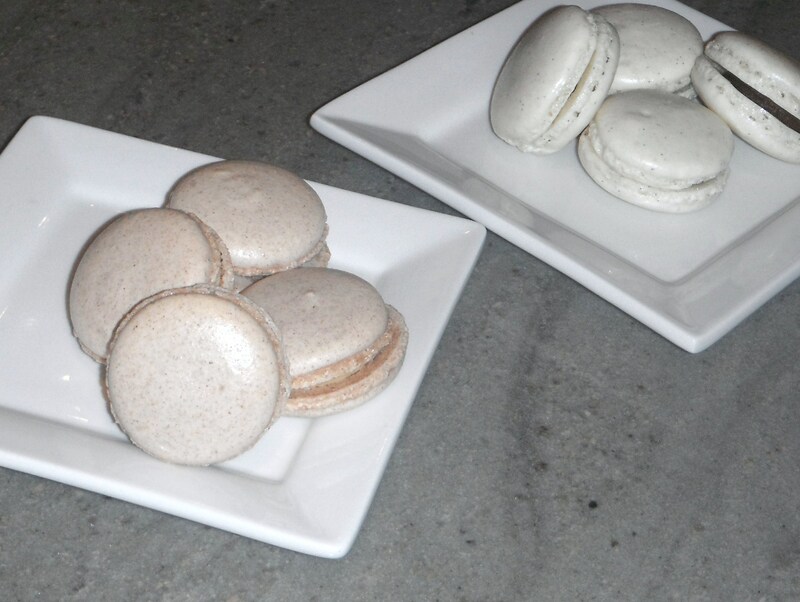 Todd suggested pairing the filling with cocoa macarons, but he's out of town and I'm not sure how I feel about chocolate and pear together...So, I decided to make cinnamon macaron shells. I used a basic recipe to which I added about 2 T of ground cinnamon. Before I share the pear cream recipe, I would like to take a few moments to talk about custards. Simply and scientifically put, a custard is a liquid thickened or set by the coagulation of an egg product. Doesn't that sound delicious?? Ha ha. Seriously, there are 2 types of custards, a stirred custard (which is stirred over heat and remains pourable) or a baked custard (which sets as it bakes). The basic rule for any custards is that the internal temperature should never get over 185 F. This is the temperature at which the mixture coagulates and, beyond that, it will curdle. So, what this means is that stirred custards should always be stirred or whisked while being heated and baked custards are baked at a moderate temperature, usually with the use of a water bath to regulate heat distribution. Some examples of custards include creme brulee, bread pudding, creme caramel, cheesecake, quiche and ice cream. Puree the pears with the lemon juice in a blender or food processor. 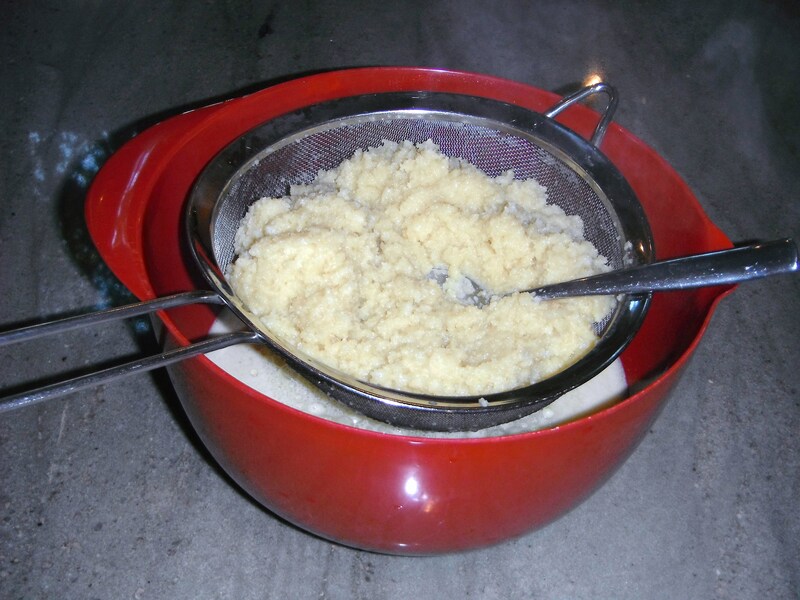 Bring eggs, yolks, sugar and pear puree to boil in a medium saucepan, whisking constantly. Continue whisking while mixture boils for one minute. Remove from heat, whisk in the Poire Williams then strain through a fine mesh strainer. This will significantly reduce the volume of your custard, as most of the pulp from the fruit (and any over-cooked custard) will be discarded). You will be left with about a pint of liquid. Once it's lukewarm, pour into the blender, along with the softened butter and blend until it is emulsified. Cool, then refrigerate overnight. It should develop the consistency of a mousse. FYI, mine did NOT. Have the consistency of a mousse, that is. Even after a couple of days refrigeration, the pear cream was still way too loose to be used as a filling. However, not one to be deterred, I put the custard back in a sauce pan and gently heated it over medium heat until bubbling. I let it boil over medium heat for about 10 minutes, whisking constantly, to allow some of the liquid to evaporate. Once the custard had thickened significantly, I put it back in the fridge to cool. When cool, it was VERY thick, so I whipped it with a hand mixer before filling. 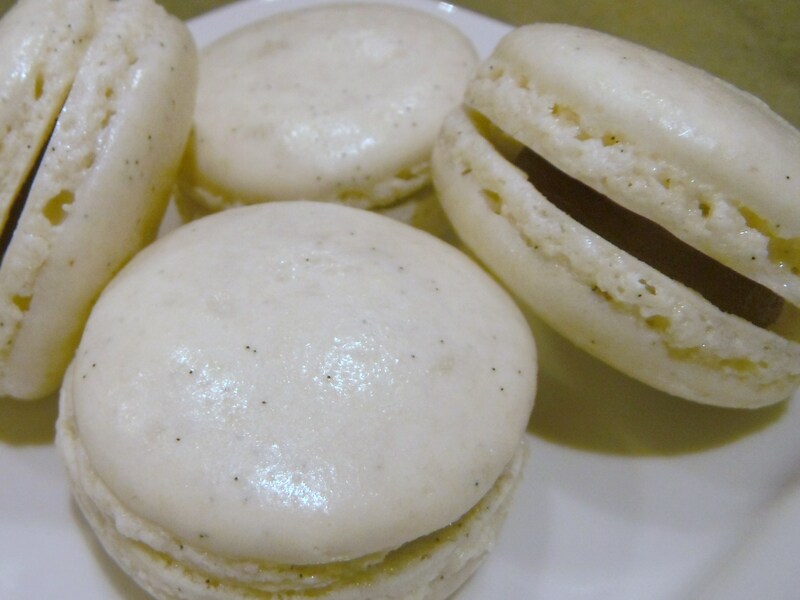 The second batch of macs I made were constructed of vanilla bean shells (basic recipe to which the insides of one vanilla bean were added to the sugar before boiling) filled with a silky, creamy pumpkin butter. The vanilla bean gives the shells a nice flavor and scent, as well as the characteristic flecks one gets when using real vanilla from a bean (check out last pic below). Cook the pumpkin and the liquid (water or cider) along with the brown sugar and all spices over medium heat until the mixture comes to a boil. 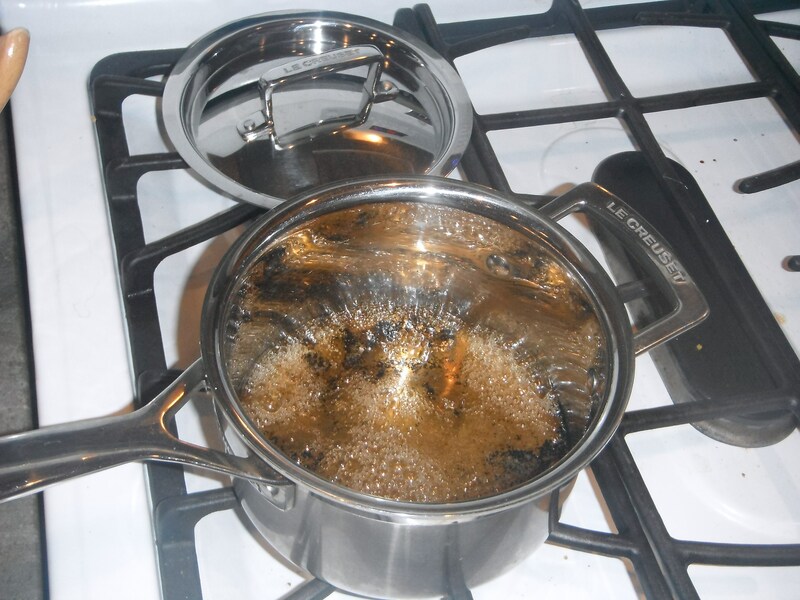 Boil over medium for about 20 minutes, whisking frequently. The mixture should be bubbling with large pockets of steam and will thicken and darken significantly. Once thick, remove from heat, stir in the salt and cool. Can be stored in the fridge for a week or two. Sandwich the macarons with their respective fillings (by the way, if you haven't already thought of it, these would also be good combinations switched around - vanilla pear and cinnamon pumpkin), cover and refrigerate. October Daring Bakers Challenge - Povitica!